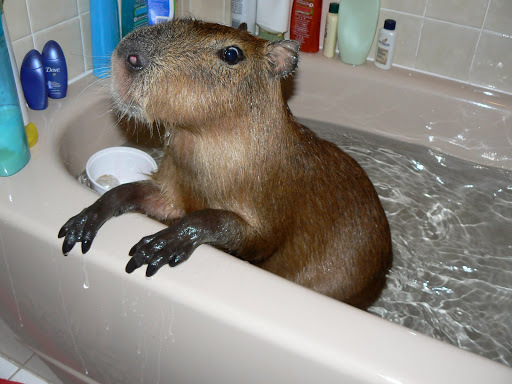 I was so embarrassed to see this photo of me NAKED in the bathtub. All of a sudden one day it was all over the internet! I don’t take many indoor baths any more because I have a great big swimming pool now. It has an edible grand staircase outside and some goldfish inside. Plus I have lots toys in there that I like (I only had some ducks and a cottage cheese carton in the bathtub). In the swimming pool I have a hula hoop to scratch my nose on. Some plastic boats to chew on. A couple frisbees and a kickboard. A great big orange ball to push with my nose (died of a fatal bite hole) And a really big innertube stuffed with Noodles (because I bit a hole in it before it even went in to the pool). The noodles were Caplin’s idea. It’s great to have a big brother- he has lots of good ideas. I don’t like his food, though. Yogurt is yucky. I tried pears, but I only bit the stem off and took some teeny tiny nibbles but it wasn’t a potato. So I left it in the bowl.